They had one in Star Trek. Why not in real life? Imagine sucking up the immense energy output of the Sun by totally encapsulating it with a vast mega-structure made of solar panels—that is the Dyson Sphere. Since solar energy’s discovery almost two centuries ago, harnessing the immense power of the Sun has been the subject of many research endeavors. As mankind’s energy consumption just keeps rising, there will come a time where we’ll have to build ludicrously large scale structures like the Dyson Sphere to quench our daily energy needs. Or develop an, as yet unknown, method of producing energy that doesn’t require a lot of space. The U.S.S. 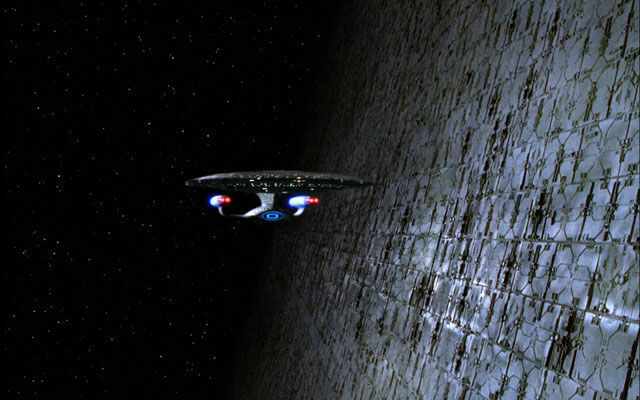 Enterprise encounters a Dyson Sphere in Star Trek: The Next Generation. Paramount. But let’s back up. In 1960, astrophysicist Freeman Dyson popularized this idea—speculating that a technologically advanced race would seek to harness their sun’s immense energy by encircling it with a sphere-like object. “One should expect that, within a few thousand years of its entering the stage of industrial development, any intelligent species should be found occupying an artificial biosphere which completely surrounds its parent star,” Dyson wrote in his 1960 Science paper. Obviously, this is way, way beyond our capabilities. Still, we have to ask ourselves this: Would it ever be feasible? As the latest episode of PBS Space Time explains, making a single vast mega-structure encapsulating the Sun is structurally impossible. We’d be faced with gravitational stresses, structural in-habitability, and location instability. Moreover, we currently don’t have the engineering capabilities nor the materials to pull this off. But collecting the entire output of our home star may still be the smart choice. What we do instead is to build a Dyson “swarm,” and not a Dyson “sphere.” The Dyson Swarm is made up of one-kilometer (0.6 mi) solar panels that orbit the Sun in hundreds of stable criss-cross patterns.